Cuba, Missouri is yet another outdoor adventurer’s paradise with twenty rustic lodges and campgrounds, three rafting rivers and numerous lakes in the area that offer great hunting, fishing, canoeing, swimming, and water skiing. When the railroad arrived in 1860, transportation of goods and products was much improved and the town became a shipping center for the region. Soon apple orchards began to be planted in abundance. From 1895 through the 1920s the community was known for its apples and for its barrel making industry. 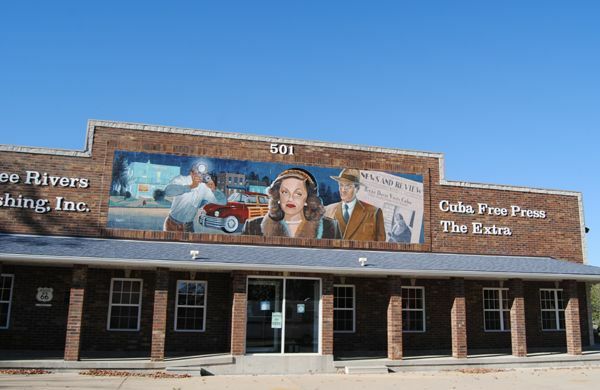 During this time, Cuba became known as the “The Land of the Big Red Apple”, and by the turn of the century, Cuba was the largest producer and distributor of apples in Missouri. Apple production declined in the 1930’s but, the community still makes barrels. 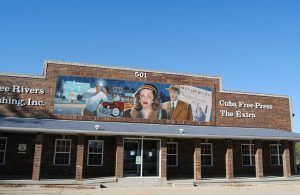 In 1931, Route 66 was completed through the city, and most of the businesses which were located by the railroad tracks, moved to be closer to the new highway. More new businesses also sprang up along the pavement including restaurants, filling stations and motels, answering the needs of traveling motorists. 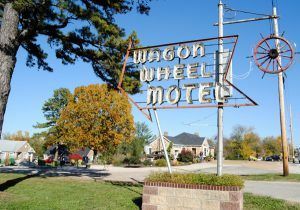 One example is the Wagon Wheel Motel that continues to stand at 901 E. Washington. Originally built in 1934, it was constructed of Ozark native stone and first called the Wagon Wheel Cabins. In 1946, it was expanded from 9 units to 14 units. 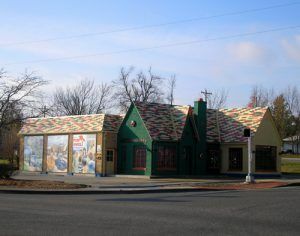 It once also featured a Standard Oil Station and a cafe. Now on the National Register of Historic Places, the retro motel continues to serve weary Route 66 travelers. At about the same time, higher labor costs drove shoe manufacturers to seek more affordable locations for their plants and many relocated to rural areas. The shoe industry provided another boon for Cuba and would remain a vital part of its economy for over 60 years. As you enter Cuba, a “new” stop along Route 66 is Missouri Hick Barbeque. While this place isn’t vintage Route 66, it serves up great Ozark barbeque and the name itself is so representative of Route 66, that we had to include it. The restaurant, complete with an upstairs outdoor deck, is a great place to watch the traffic during the summer months. It is located at 913 E. Washington Street. Another vintage peek of the Mother Road is available at the old Carr Phillips 66 Service Station, circa 1932, at the corner of Washington and Franklin Streets. As you continue your trek along Route 66 to Rosati and St James, Missouri, you will pass by numerous wineries and vineyards in this rich wine producing country. My father was raised in Cuba, Missouri and his father Mr. Obrock was the pharmacist in Cuba. As a young boy, my father worked at the first Motion Picture show in Cuba. He told so many great stories of that most fine Town!